How Much Does a Limo Cost? You want to rent a limo, so you Google “how much does a limo cost”. Now what? It can be very intimidating for someone to call about the cost of a limo if you haven’t done it before. Most people don’t have a lot of experience with limousines and transportation and may not be sure how to start. Wanna Get Right to it? So you want to rent a limo? You want to rent a limo, but you are not sure how much a limo costs. It can be very intimidating for someone to call about the cost of a limo if you haven’t done it before. Most people don’t have a lot of experience with limousines and transportation and may not be sure how to start. It even becomes more complicated when you start to learn about how many different types of limousines exist. Consider the ways you can book them and the answer to a cost of a limo becomes even harder to define. Unless you are lucky enough to know somebody who owns a limo company, it is best to come prepared with your questions and ideas before making that first call. So let’s talk about the best way to price out a limo for your next event. There are the top 4 things you need to know when trying to determine how much a limo costs. Not all stretch limos are the same. Some limos hold only 7 or 8 people while others might hold 20 people or more (known as Super Stretches). Some limos might be SUV’s made into limos while others might be traditional sedans. Each type will have a different cost so knowing how big a limo you need and the type you want will be a big help. Like many other services, certain days of the week or times of the year have a greater demand. Demand will definitely play a role in how much your limo will cost. Saturdays are popular wedding days so the cost of a limo is often greater because limo companies are busier. Meanwhile, Tuesdays are much slower resulting in a lower cost of a limo. So renting a limo for a concert or sporting event during the week will likely cost less than it would on a weekend. 3. How long do you want the limo? Most limos will cost you an hourly rate. Hourly rates for limos can range anywhere from $75 to $200 per hour depending on the company and the style of the limo. Sometimes, there are minimums for renting a limo so understand that you probably can’t rent a limo for only 30 minutes. However, when renting a limo for longer periods of time, say 7 hours or more, you may get a discount on your hourly rate, lowering the total cost of the limo. Many rentals for events like Nights on the Town or Bachelor or Bachelorette Parties will last 8 hours or more. 4. Is gratuity included in the cost of the limo? Every company handles gratuity differently. Some companies will include the gratuity in the cost of a limo and others will add it as a separate charge when quoting you. So when calling for a quote, make sure you ask if the gratuity is included in the cost of the limo. Events like weddings often will include the gratuity as they know the bride and groom will likely not be carrying cash with them on the day they use the limo. Rates are average rates across the country and may be higher in metro markets (greater Philadelphia area). Rates also reflect weekday averages and not high-volume times (Thursday-Sunday) or during traditional busy periods (Weddings, Proms, etc.) when demand is highest and availability is at its lowest. Rates also will be higher for Luxury brands. Ultimately, there are many factors that will impact the cost of your limo. It is important that you ask questions that will help you determine the total cost of the limo. When possible, take advantage of the slower times when you can save money on the cost of the limo. If you have to rent a limo during a busy day or time of the year, consider renting it for a longer period of time, reducing the hourly cost of the limo, especially for special events like a Wine Tour. Finally, enjoy the limo! Renting a limo is a special event and you should make the most of the time in the limo. For one night, you get to be that famous movie star or rock star, relaxing in the back of an amazing limo! Here are some of the more popular questions we get asked. Q: How much does it cost to rent a limo per hour? A: As the table above shows, the costs can vary depending upon the type of limo, when you want to book the limo and how long you want to book the limo. The best way to confirm the price is to speak directly with a limo company. Q: How much does it cost to rent a limo for a wedding? A: The cost to rent a limo for a wedding will depend on a variety of details, including day of the week and the season. Hourly rates can vary from as low as $100 to as much as $300 as more depending on the vehicle size. Q: How much does a limo cost for a day? A: The limo cost is based on how many hours you need it, recognizing that the longer you rent the limo, you may get a discount on the last few hours. So you need to confirm how many hours you want the limo to determine the cost for the day. Q: How much are limos for prom? A: Similar to weddings, limos for prom can cost more than other events due to the high demand. Hourly rates can vary from as low as $100 an hour to upwards of $275 depending upon the size of the vehicle. 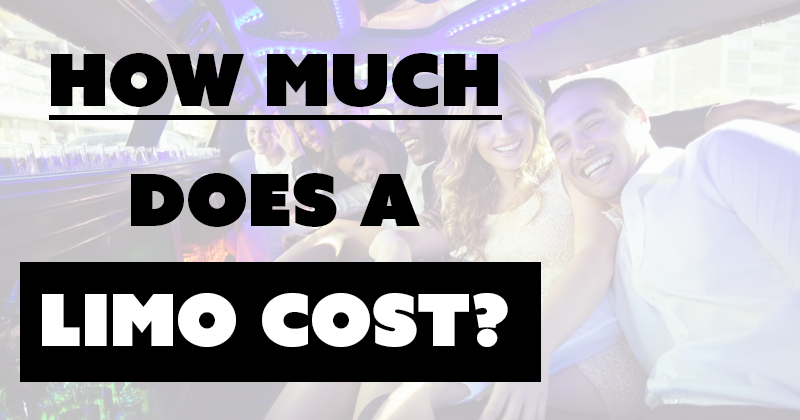 Q: How much does it cost to rent a limo for 5 hours? A: According to normal rates, it could cost as little as $425 and as much as $950. To confirm your cost, you would need to define the type of limo you want to rent and when you want to rent it. Q: How much is it to rent a limo for a day? A: If you want to rent a limo for the day, you would expect the cost to be anywhere from $600 to $2,000 or more. The range in cost is due to the size and time of the year when you want to rent a limo. Q: How much do you tip a limo driver? A: You will tip a limo driver based on the number of hours you rent the limo and the total cost of your rental. Generally speaking, most people tip 18% to 20% of the overall cost.